The Masters Superbike Championship continues its busiest ever schedule with Rounds thirteen to fifteen of the 2017 season, this weekend at Mondello Park. The Leinster Motor Club will take control of the two day race meeting which will also count towards the Irish National Championship. The weekend of action on the Mondello Park National Track gets underway on Saturday with Qualifying and race one of the three races scheduled. 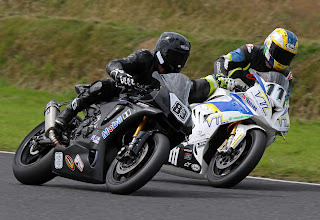 Sunday's action will centre around the second and third Superbike and Supersport races of the weekend with Superbike race three carrying the 'Leinster 200' title and Race three for Supersport being nominated as the 'Leinster 100'. The two stand out riders of the 2017 season so far have been Richie Ryan who leads the Superbike points by an enormous margin and Jason Lynn who moved into the Supersport lead at the most recent Masters event. Ryan, riding his first season in Superbike aboard his Mobil1 Yamaha R1, has impressed with his speed and consistency and sits more than three maximum scores ahead of his nearest rival Charles Stuart who took his Yamaha to a maiden victory in round twelve. The Superbike 'Cup' battle is hotting up with four riders now in contention due to runaway leader Andrew Murphy crashing out of the last event in July and failing to pick up a single point. Michael Gillan leads the way from Raymond O'Neill, Murphy and Eddie Healy who has two hat-tricks of wins from his two Masters visits this year, as well as a third place overall. Lynn has been the Master of the Supersport Class since the second event of the year and has gradually closed down and passed his main championship rival Ross Patterson. Patterson took his first win since round five at the last race in July but eight podium finishes in a row, including five wins have allowed Lynn to move past into a twenty point championship lead. On the way Lynn has become the most successful Masters Supersport rider as he now holds the records for most wins, most podiums and the highest number of points scored in the class's history. 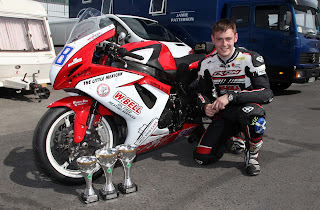 The Supersport 'Cup' cup lead belongs to Eunan McGlinchey but his efforts to win a race outright have enabled his 'Cup' rivals to stay in touch. McGlinchey's incredible speed has allowed him to mix it with the front runners and even lead a race overall but pushing to the front has led to two accidents in recent races bringing his points gap down to just thirty five points over Luke O'Higgins. In the main supporting class, Principal Insurance Pre-Injection, competitors have upped their game recently with the arrival of some new competition. Highly experienced Alan Kenny joined the grid two events ago and since then the series regulars have been woken up by his pace leading to the lap record being broken on more than one occasion. Kenny has won all six races he has contested but series leaders Joe Grant and Darryl Sharkey, along with the Prendergast brothers, Ian and Michael, have pushed him hard and his winning margins have been reducing with every race.